The three monarchs depicted were the last legitimate heirs of the House of Stuart. King William and Queen Mary were crowned in April 1689 and were, as co-rulers, unique in British history. Their landing at Torbay in 1688 led to the abdication of Mary’s father and William’s uncle, James II, and resulted in the creation of the British constitutional monarchy. Mary died of smallpox in 1694 and William continued to rule as monarch in his own right until his death in 1702. He was succeeded by Queen Anne. The reigns of William and Mary and that of Queen Anne saw Britain's emergence as a global naval power. Though marked by nearly twenty years of war with France, their reigns also saw the founding of the Bank of England in 1694 and the Act of Union between Britain and Scotland in 1707. 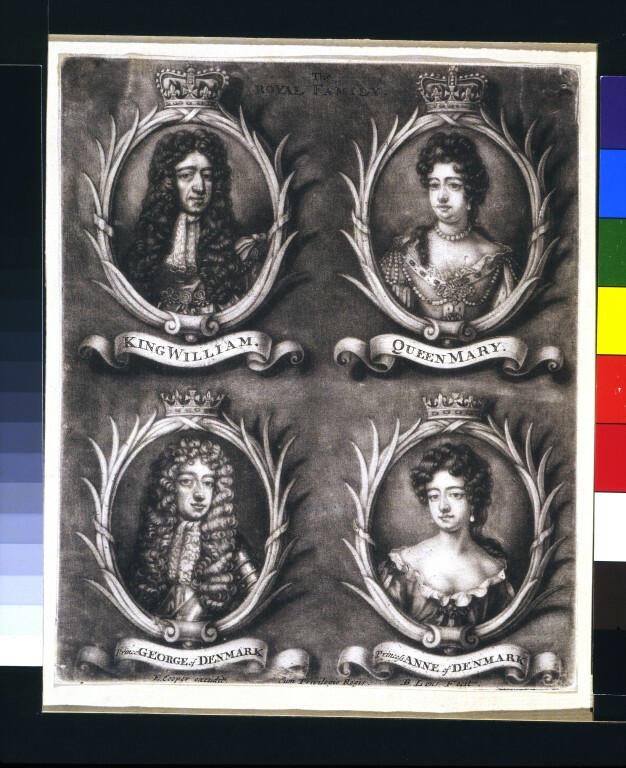 In this print the four portraits are enclosed in oval borders, surmounted with crowns. William and Mary are placed above George and Anne, the next in line to the throne. This points to a production date after 1689, and certainly before 1694 when Mary died. Mezzotint is an intaglio printmaking process. This technique allows for a greater effect in the gradation of tone. The engraver employs the use of a rocker – a tool used to roughen the surface of the metal plate from which the print is made; the printing surface is then smoothed with a burnisher so that certain areas of the plate retain more or less ink than others: the more an area is burnished the less ink it will hold, and the lighter it will appear when printed. Bernard Lens [II] (1659/60–1725) was an engraver, noted particularly for his mezzotints, who established a drawing school in the 1690s in St. Paul’s Churchyard, London. He was the father of the miniaturist Bernard Lens [III] (1682–1740). 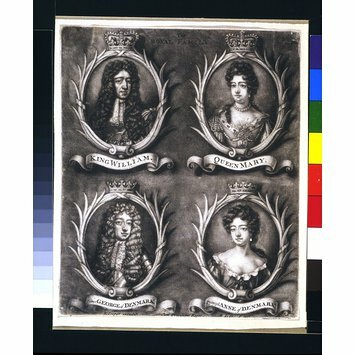 Print of four portraits depicting William III, Queen Mary, Prince George and Princess Anne of Denmark, as head and shoulder portraits in decorated ovals, with crowns at the top and banners, containing the names of the sitters, at the base. William III is shown wearing a long wig and cravat, and facing slightly to the right; Queen Mary, her hair piled high and wearing a necklace of pearls, is facing slightly to the left; George of Denmark wears a long wig, cravat and armour, and is turned slightly to the right; and Princess Anne wears a loose gown and pearl earrings, and is turned slightly to the left. Engraved text of the individual names of the sitters, which is underneath each oval portrait in a decorative banner. Engraved text at the top of the image. Engraved text at the base of the image. Inscribed in pencil on the mount. Smith, John Chaloner. British Mezzotinto Portraits. London: Henry Sotheran & Co., 1883.